Civil Engineering and Construction are two of the most important and diverse industries with a wide skills base and numerous career opportunities. Our Civil Engineering and Construction courses prepare students for a range of technical, professional and management careers in civil engineering and construction. Students are provided with specialized studies which are directly relevant to their occupations or to the occupations in which they intend to seek employment and enable them to make an immediate contribution within the industries. Our teaching staff has all the attributes required for the members of a quality construction department. With excellent facilities and expert lecturers, NIET is able to provide students with the flexibility, knowledge, skills, understanding and motivation needed as a basis for progression to further study or career opportunities. Civil Engineers convert complex ideas into realities. 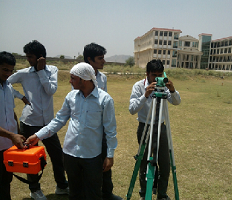 The objective of the civil engineering department is to provide students specialization in Design principles and application, Science and materials, Applied mathematics, Managing principles and Application, Group project, Health, Safety and Welfare, Geology and Soil Mechanics, Civil Engineering Technology, Structural Analysis and Design, Site Surveying Processes. To provide students specialization in design principles and application, science and materials, applies mathematics, managing principles and application, group project, Health, Safety and Welfare, Geology and Soil Mechanics, Civil Engineering Technology, Structural Analysis and Design, Site Surveying Processes. To provide students the best of learning techniques through a combination of formal and informal sessions including practical, resource – based learning activities with tutorial back-up, together with work based learning. 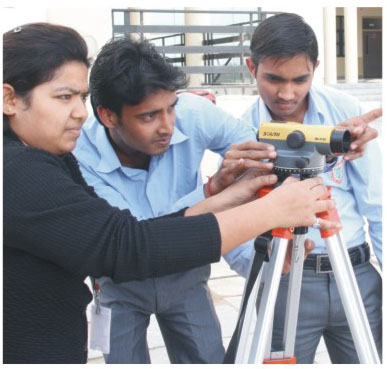 Civil Engineers enjoy wide career opportunities. Employment with a wide range of organizations such as local authorities, building contractors. Power companies, environmental agencies and specialist consulting firms. You could also find work overseas with Govt. consulting firms. Mokshagundam Vishveshwariah Sir MV; 15 september1860- 14 April 1962 was a notable Indian engineer, scholar, statesman and the Diwan of Mysore during 1912 to 1918. He was a recipient of the Indian Republic’s highest honour, the Bharat Ratna, in 1955. He was knighted as a commander of the British Indian Empire by king George V for his myriad contributions to the public good. Every year, 15 September is celebrated as Engineer’s Day in India in his memory. He is held in high regard pre- eminent engineer of India. He was the chief designer of the flood protection system of the city of Hyderabad, as well as the chief engineer responsible for the construction of the Krishna Raja Sagara dam in Mysore. He is also revered a lot in the state of Karnataka. 2. Fixing a point with reference to two fixed points. The behavior and properties of structural materials, e.g. concrete, asphalt and steel can be better understood by detailed, well-designed, first hand experience with these materials. The students will become familiar with the nature and properties of these materials by conducting laboratory tests. These tests have been selected to illustrate the basic properties and methods of testing of cement, aggregates, paste, mortar, concrete, asphalt and steel. 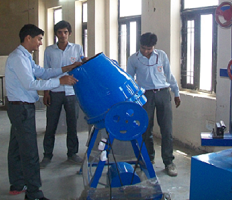 Test procedures, sometimes simplified because of time limitation, are mostly those outlined by the Indian Standards. The objective of the Fluid Mechanics laboratory is the study of the phenomena and effects of flow of fluids and polymers by using experimental measurements and computational modeling. The specific fields acting the FM lab are gas-thermodynamics, combustion, atmospheric pollution, natural flows and all process including flow and transport phenomena in one-phase or multiphase flows. Also, the FM&T laboratory can offer services of testing and calibrating flow measurement devices.